GTS Edition - Made to order, the 2T GTS Edition offering 12" tubeless wheels for extra stability for racing or touring. Available in 125cc or 150cc 5 Port. Thanks to LML India, whos colaboration with piaggio in the 1990s to build the vespa, still continue building scooters today now called the LML Star. However this modern PX design is not for everyone with many wanting that original 1960's look so we re-created the SS180 with our vintage bodykit. We take a brand new LML Star (2 or 4 stroke variants), we custom fit the original design panels, mudguard, bumper and indicators to offer the authentic vintage look. We don't use cheap fibreglass or plastic side panels and mudguards, we use metal body panels made to the original specification and specially adjusted to fit the LML Star and Vespa PX. Additional smaller parts are made in high quality ABS also designed and produced inhouse by us. This custom body change, requires no holes drilled and the scooter can be put back to standard modern design if required. 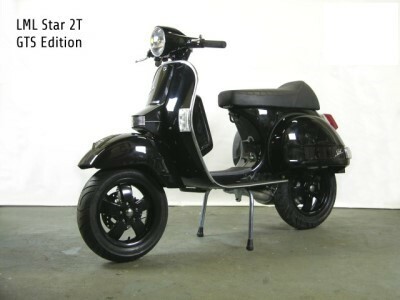 But the real beauty of this scooter is that whilst it looks like a vintage scooter it is still a brand new scooter which you do not need an MOT for 3 years and has a 24 month warranty. Enjoy the reliability of a new scooter, the latest modern engines and all the modern features underneath but with the true classic vintage design. All models are availalbe on special order, delivery time can vary but approx 3-5weeks. If you would like to order a complete scooter, or if you have any questions please call 0208 150 7274 or Email Us with your requirements.